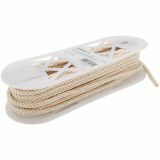 Large Twist Cord 1/4"X12yd - WRIGHTS-Large Twist Cord. This package contains 12yd/10.97m of 24% polyester/76% cotton 1/4in cord. Care: machine wash delicate, tumble dry low. Imported.